How to Easily Master Format MOTOROLA MOTO Z (FORCE) with Safety Hard Reset? Tips and tricks to fix MOTOROLA MOTO Z problems, some location also have other name as MOTOROLA MOTO Z FORCE DROID and the specifications is not very different with MOTOROLA MOTO Z FORCE. Some users will try to find bigger RAM to run multiple applications together, therefore MOTOROLA release MOTOROLA MOTO Z with 4 GB RAM, we can choose to buy 32 GB or 64 GB internal memory. Both product have the same specifications and have 5.5 inches LCD screen. Find more review and more solutions about MOTOROLA MOTO Z trouble at www.hard-reset.org. What are the differences between MOTOROLA MOTO Z (MOTO Z FORCE DROID) vs MOTOROLA MOTO Z FORCE? The Main differences between both of them are about main camera which have 21 megapixel at MOTO Z FORCE and have 13 megapixel for MOTO Z. Both camera have same features like OIS and fast accurate laser autofocus. Other differences are battery capacity. For someone who work very hard with their smartphone then using MOTOROLA MOTO Z FORCE is recommended because it have bigger battery capacity at 3500 mAh. The bigger battery will make the weight of MOTOROLA MOTO Z FORCE is more heavy then MOTOROLA MOTO Z. How to backup data or Contact at MOTOROLA MOTO Z (FORCE)? MOTOROLA MOTO Z comes with external microSD slot and that is not join together with GSM simcard slot. We can use microSD external card to copy or move important files using File Manager applications. If our MOTOROLA MOTO Z (FORCE) has already signed in with Google account, by default our contact will be synchronize in the background to Google server. Please make sure we check all contact at Google contact server using Internet browse to make sure backup is done. MOTOROLA MOTO Z (FORCE) have external memory slot which can read and write maximum 256 GB card, but we also can use lower capacity like start from 4 GB or 16 GB or above. When we take photos or video recording, usually by default will be save into internal memory, therefore we have to copy manually all important data include photos and video using file manager to external memory. Is That Any Secret Code for Doing Format MOTOROLA MOTO Z (FORCE) ? 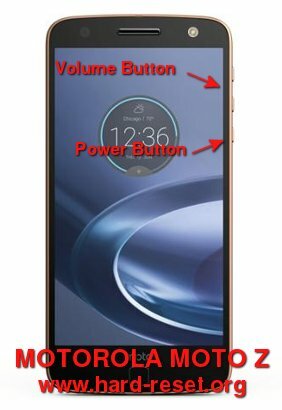 There is no secret hidden code for MOTOROLA MOTO Z (FORCE) to make it back to factory default. Do the options above to hard reset it. How to Format or Erase Phone Memory at MOTOROLA MOTO Z (FORCE) ? There are two phone memory type at MOTOROLA MOTO Z, one is internal memory and the other one is external memory. If we want to format internal memory phone then we have to do hard reset or reformat the operating system of MOTOROLA MOTO Z (FORCE) as well. Please use menu setting to do hard reset or reformat using #option 1 above, but make sure to give checkbox mark at Erase Internal SD card / Internal storage. Then it will reformat the factory default operating system and remove or erase any data inside internal memory. How to Make Battery of MOTOROLA MOTO Z / Z FORCE Stronger, Life Longer and Not Fast to Drain ? Now we know that having MOTOROLA MOTO Z with 5.5 inches LCD screen with 4 GB RAM will make users use this phone work more and install many applications. Therefore having 2600 mAh battery capacity is not enough for that kind of users. Therefore we have to do some adjustment especially when we use MOTOROLA MOTO Z for playing games or watch movie. First try to adjust LCD screen brightness as low as possible, it will help to prolong battery life before empty. We also have to disable all not use connections because they still will consume battery power like Bluetooth or Wifi or GPS or NFC. How to Easily Master Format SAMSUNG GALAXY J2 PRIME with Safety Hard Reset? How to Easily Master Format LENOVO A316i with Safety Hard Reset?